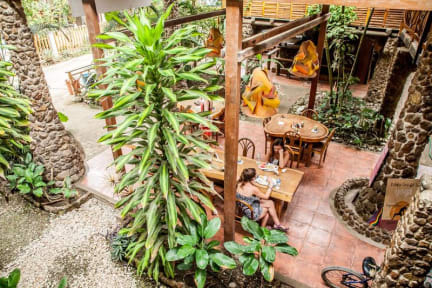 Welcome to Casa del Sol; a hotel that is uniquely designed with a perfect balance of stone and bamboo, encompassed by an infinite supply of good energy! Here at La Casa we not only provide a comfortable and tranquil place to sleep, but with so much going on, we offer you an unforgettable vacation experience!!! We have 2 common areas for socializing or relaxing and hammocks on the shared balconies. Freshly made lunches and dinners are available throughout the week, and for $1 per day, there is unlimited coffee, tea and drinking water provided! Other activities on site include movie nights in our outdoor theater, Spanish classes in a private or group setting, a bamboo yoga studio with 10+ movement classes per week and our in house surf instructor to help you explore the waves! Located in an area called ‘La Punta’, we are a 5 minute walk north on the beach from Montanita town. The hotel is situated in front of the famous surf break and is super chill, and quiet. Accommodations are rooms with a double, queen bed or king bed or a 4 bed dorm room. All have private bathrooms, with hot water, wi fi and include a different, delicious breakfast each morning! The rooms share balconies with hammocks, and all face our courtyard. Hostal Casa del Sol Policies and Conditions. Children 5 years old and under staying free, 10 years old and under 1/2 price.